Marinade meat, covered, in fridge over night. Place on foil in 200 degree oven with the door propped open until pliable. Enjoy! Tried this recipe with Kangaroo in my meat dehydrator box. Bloody delicious! GREAT RECIPE! Simple and makes great deer jerky. Will the recipe work equally well in a dehydrator. 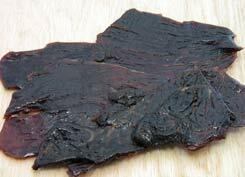 Is it risky making the jerky without a “cure” product? The “cure” products are salt, vinegar and Worcestershire. This is a basic, sound recipe. Love how easy and simple this is to make also has outstanding taste just made my second round of this!